Another month and another batch of great new releases. 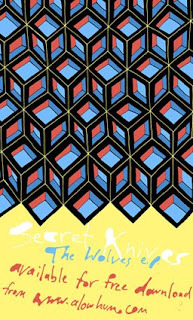 Over the last few weeks I have been returning again and again to a stunningly good EP, The Wolves, from Wellington band Secret Knives. The band mix chiming guitars with electronic textures and angsty, but not overwrought, vocals. Without sounding like any of the current crop of American indie bands like Vampire Weekend, Yeasayer, Beach House etc. they would sit comfortably in a playlist alongside those bands and match them for quality. For a New Zealand comparison think of maybe a happier Shocking Pinks. There is very little info to be had about the band but the seven track EP has been getting rave reviews on NZ and international blogs. This is one of my favourite NZ releases of the year and is available for FREE download from A Low Hum. Highly recommended. Also out this month is an eclectic EP, You Have Been Warned from the New Telepathics, the musical vehicle for Darryn Harkness - producer, song writer and multi instrumentalist. Harkness has just recently returned from London and has played a bunch of live shows for the first time in nearly a decade. Both live and on the EP this is not standard fare. Harkness mixes sound improvisation, indie rock, afro-beat and jazz and out of it creates challenging and engaging music. Well worth watching is a live-in-the-studio performance recorded at the Red Bull studios. (I only just discovered this site but there is a whole treasure trove of material here for NZ music fans. I've posted one New Telepathics track on the video page). Lawence Arabia is James Milne who also heads the Reduction Agents, whose album Dance the Reduction Agents was one of my favourite albums of 2006 and is highly recommended. Although very good I wasn't quite so keen on the self titled Lawrence Arabia album that came out around the same time, maybe it's just that I'm more of a band man, but this new song, 'Beautiful Young Crew', available on his myspace page, has really grabbed me. Up next are Thousand Suns, who have released an album of easy-going guitar and percussion world-music influenced pop called Fascination. I have to say the bongo drum (I'm sure there must be a more correct musical term) got a bit much over a whole album but taken song by song there are some great laid-back summer tunes here as demonstrated on the song included in this episode - Something Beautiful Exists. You can buy the album and sample more tracks at Amplifier. Steve Abel has long been a Counting The Beat favourite. His album Little Death won a well deserved Album of The Year in the inaugural Alternatuis. A new album, Flax Happy is due soon and the songs that have surfaced to date are certainly whetting the appetite for another classic. You can download 'Sad Girls' from Steve's website and hear 'Sally' on his myspace. And a plea, English band House of Love recorded a cover of The Chills 'Pink Frost' which I have not been able to track down anywhere - does anyone have a copy I can get an MP3 of? Contact me at the email link at the top of the page.